I guess you might call this Housekeeping Week here at ProjectHappilyEverAfter.com. Yesterday you got tips on bathroom organization. 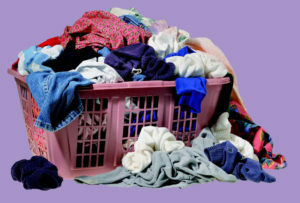 Today another guest poster will offer tips to help you stop fighting about dirty laundry. I met Sarah Welch while we were both waiting to be interviewed for the 10! Show in Philadelphia. We have a lot in common. I’m guessing her house is a lot cleaner and more organized than mine. But, hey, it’s not a competition and she’d be the first to tell you that. Sarah is the co-author of Pretty Neat and the co-founder of GetButtonedUp.com. My dear husband seems to miss the point of hampers entirely. Perhaps that’s unfair. What he seems to miss is that there’s an inside to the darn things. When he sheds his clothes for the day, they always end up on top of, hanging over the side of, or balled up next to…but never in…the laundry basket. Invariably when I go to toss clothes of my own into the basket, my biceps get a little workout as I struggle to lift a lid weighted down by several pairs of jeans and fleece jackets. A baseball cap often flutters to the floor landing next to some balled up boxers or smelly socks. It’s a constant source of frustration. I’ve tried ignoring the problem, gently reminding him of how hampers work, removing the lid, lobbing dirty socks at him…wailing and gnashing my teeth. It’s not that he’s trying to make me nuts. He simply doesn’t see the basket as anything more than a flat surface, despite its cylindrical shape. And the occasional floor dropping? He doesn’t “see” those either. In the scheme of things, it isn’t that big of a deal. It only affects our room, and it only takes me a few seconds to either deal with or work around. But I’d be lying if I said it wasn’t a significant source of marital tension. To be fair, my tendency to shove groceries willy-nilly into the fridge and pantry drives him equally batty. 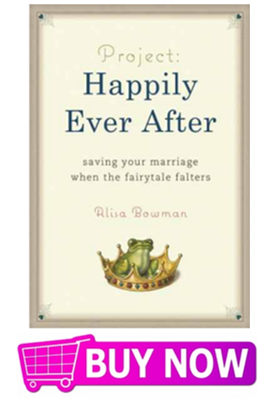 Like it or not, our individual organizational tics can create minefields in our marriages. The little things, like dirty dishes that never make it into the dishwasher or dirty clothes that never make it into the hamper, are the cavities of our unions. Little holes that, if ignored, will eat away and eventually rot something once solid. The key is to catch your organizational cavities before they cause serious damage. Stop complaining & fix it already. Tired of complaining about my husband’s clothes-dropping habits and hearing him grumble to me about what a mess the fridge was, we agreed recently that we needed to stop whining and do something about it. Complaining is so darn impotent; there’s an inherent resignation in every complaint that things will not change. We both needed to figure out ways to trick ourselves into doing things we didn’t think we liked doing, such as putting the groceries away neatly and yes, getting clothes inside the hamper, on autopilot. It turns out the fix for his hamper-myopia was relatively simple. We put a little basketball hoop right over the opening and, voila, it was transformed from something he just didn’t see into a fun game he plays twice a day. I have to admit I really enjoy the thrill of sinking a sock from across the room now too, something I’d never have experienced if it weren’t for his shortcoming. Addressing the grocery pit ended up being simple too. I created some pretty stickers to indicate where items should go, and can now not only put things away faster but shave minutes off of meal prep every, single, day. Not a bad thing. I also love seeing him smile whenever he opens the pantry. The bottom line is: actions speak louder than words. Nothing says “I love you” more powerfully than addressing the one or two tiny little things you do on a regular basis that make your spouse nuts (and not in a good way). So what about you? How do you currently handle your organizational differences? How might your union be improved if you stopped complaining about each other’s organizational tics and actually thought creatively about how to solve them with minimal effort? Can a cheating spouse ever reform?